One of the most exciting marijuana experts I’ve ever met is Subcool, the head guy over at TGA Seeds…and he is really good at using trellis netting and other tactics so your plants get bigger yields. When you watch his Weed Nerds YouTube shows, you often see huge cannabis plants indoors and outdoors that are properly trellised so their limbs don’t break. 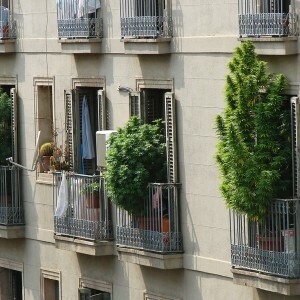 If you’ve read a lot of articles here at BigBudsMag.com, you’ve seen photos of trellising. It’s often associated with Sea of Green, SCROG, and other techniques, but people like Subcool apply it to growing full-size plants. 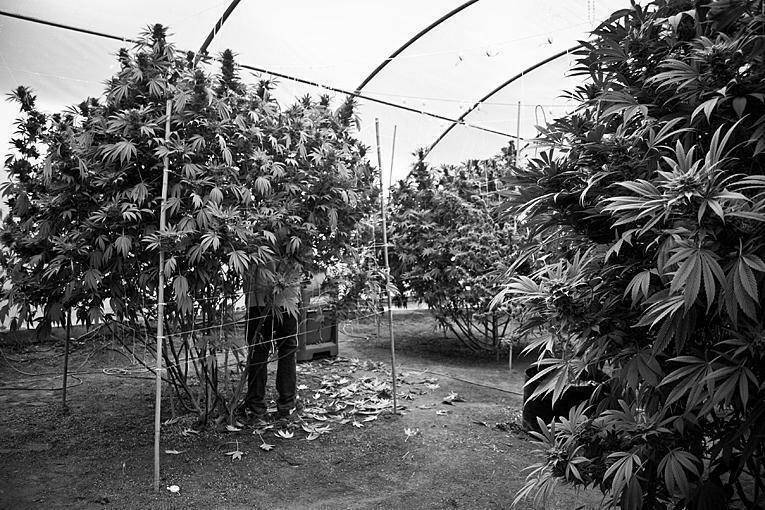 Trellising is but one method of supporting marijuana limbs. Growers also use tomato cages, and plant stakes. The need for plant support comes from pruning and topping your plants. Left to follow their own genetic impulses, your plants will grow into a Christmas tree shape and not need support. But when you “top” your plants, you produce a doubling of shoots every time you top. The first step is to cut off the topmost shoot. This creates a hormonal change that encourages your marijuana plants to branch more and go round rather than tall. Then you find side shoots that are almost as tall as the trimmed-off topmost shoot, and trim those too. You’re looking to create a flat, wide canopy of growing shoots. Instead of having one main top stem with a bunch of subordinate stems underneath, you have a wide canopy of stems that are the same height. Then you install trellis netting at just the right level so your tops grow through the netting. You may need to install more than just one net. For example, I like to top my plants about 14 days before they go into bloom phase. This gives you shoots that are developing as your plants go into bloom. The vigorous growth channeled into those shoots gives an extra boost to early floral development. And if you stoke that development with a hydroponics booster called Bud Ignitor designed to create earlier and more numerous budding sites, you get even more yield per plant. When marijuana growers first started using topping and pinching off techniques, they discovered they were creating problems that they didn’t anticipate. One problem is your plants are bushier. This affects air flow, plant “breathing,” and light penetration. So what you do is, after you’ve topped your plants and they’ve responded with new growth at every node, carefully go through each plant and trim off sucker growth and inner foliage to open up plant aeration and light penetration. You’ll be removing only 5-15% of total foliage, and you aren’t removing all the bottom foliage to leave the plant with bare stalk starting at the root zone and going up several inches. Instead, you’re taking small suckers and some large leaves that are buried deep in the canopy. These aren’t going to help with photosynthesis, and they’re not going to offer structure or sites for buds. Whenever you do significant trimming, make sure you aren’t doing it just before your plants go into bloom phase or during bloom phase, because this can harm cannabis plants, slowing growth and delaying floral maturation. As your new top shoots develop, pull them apart and weave them through trellis netting. Yes, trellis netting has to be supported, preferably from all sides of your garden. It lies horizontal across your garden taut and flat, and has to be supported enough so it can handle the weight of your plants. Somewhat like a tapestry weaver, you insert your growing tops through the netting. If the tops grow high and start fo flop over, install another layer of netting and again weave them through. Yes this is labor intensive, and requires careful handling or you could break off or severely bend some branches (if they’re only bent but not totally broken, tape them up firmly with plant tape and they’ll recover). Increase your lighting intensity and consider placing lights so you get more light penetration in from the side. You’ll have denser plants with longer colas. and they’ll want more grow lights. Also increase your aeration fans so you blow stale air out and fresh air into the marijuana canopy. Remember that your plants have more cola tops than they naturally would. So give them B-52 or Organic B vitamin boosters to help them handle stress, and give them slightly more ppm than usual of your base nutrients so they have the extra iron, nitrogen, and other elements to handle new growth that your topping and trellising are meant to achieve. When you properly use trellis netting whether in sea of green, screen of green (ScROG) or with larger marijuana plants, you get longer, thicker stalks less prone to breakage…and more buds per grow season! Show This to Anyone Who’s Against Marijuana! Grow Bigger & Fatter Marijuana Resin Glands Now!